Tough Turf? Aeration May be the Answer | Gardens Alive! Question. We started with a new natural lawn care provider this Spring and the results have been great. But now they're trying to convince us that aeration is a necessary part of growing grass without chemical fertilizers or pesticides. Is this just a sales pitch? Would it be okay to aerate my lawn next Spring to try and improve the drainage? It's very compacted - I have golden retrievers who play on it all day - and water sits on top for days after rain. Answer. I'm a huge fan of aerating lawns—as is virtually every lawn care expert I've ever interviewed. 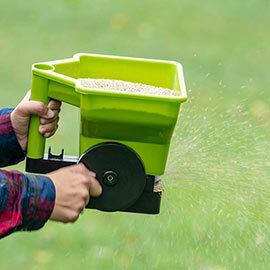 Far from a sales pitch, occasional aeration is an absolutely essential element of any lawn care plan: chemical, organic, or anything in between. Unfortunately for Karen, aeration may not be enough to remedy her wading pool masquerading as a lawn. She IS right that aeration IS the remedy for compacted soils, but dogs aren't a typical cause of compaction, and her retrievers almost certainly aren't responsible for those watery woes. That kind of serious compaction generally comes from use of heavy equipment (like big lawn mowers) and/or lots of people running on top frequently—like the famous Kennedy family football games of the 1960s. And Spring is not the time to aerate most lawns in the North. The most common Northern lawns—composed of cool season grasses like bluegrass, rye or fescue—should be aerated in late summer/early fall, when the grass is growing strong after the worst of summer's heat has passed. The warm-season lawns most common in the South, like Bermuda, centipede and zoysia, should be aerated in the Spring, when they're actively growing again after winter. BUT (you knew a big 'but' was coming down the pike, didn't you? ), if aeration this fall doesn't significantly improve the drainage next Spring, she should plan to tear it all up and replant a new lawn in late August or September of next year. Tilling up the soil, adding lots of organic matter in the form of compost, and spreading new seed should be enough to cure most drainage issues. If a severe problem is uncovered during the tilling, have drain tiles installed before seeding. READ COMPLETE ANSWER Question. I was at a store a few weeks ago and saw pelletized peat moss labeled as a soil aerator. The claim was that the pointy pellets will get shoved into the soil, thus aerating it. Sure seems easier than pulling out plugs. What do you think? Answer. I think it sounds like 'Land in a Bag', Nancy: "just take it home, spread it on a marsh and build on top the very next day!" In other words, don't waste your money. Nothing you can spread or spray on a lawn will have anywhere near the impact of aeration. The only thing that even comes close is the cumulative effect of many years of Fall feedings of compost. Research shows that feeding your lawn by applying an inch of compost in the Fall can improve the structure of the soil underneath over time. Your pointy peat moss is just...well, pointy peat moss. Same with the famous lawn-aerating sandals and other gimmicks that just poke holes in the grass. Such dangerous dancing at the correct time of year CAN kill beetle grubs feeding on the lawn's roots below (see this beetle grub Question of the Week for more details on this fun fact), but you must remove material to relieve soil compaction. For big lawns, that means using a machine called a core aerator. For small lawns, you can try a tool called a handheld corer or manual aerator that uses hollow tines to remove plugs of soil. Question. Mike: How late can I aerate and overseed my yard? The company I want to use can't come out until November. Would I be better off waiting until next Spring? Next Fall? Answer. The ideal time to overseed a cool-season lawn is late August through September. EARLY November might work if the National Weather Service is correct and we have a mild winter. But maybe the The Farmer's Almanac will be right and that winter will arrive cold, mean and early. You can certainly have the aeration done this year. Dr. Christians says that the grass just needs a month to recover before the soil freezes hard for the winter. Then have them overseed next year—in the fall; Spring seeding is a waste of money for cool-season lawns.